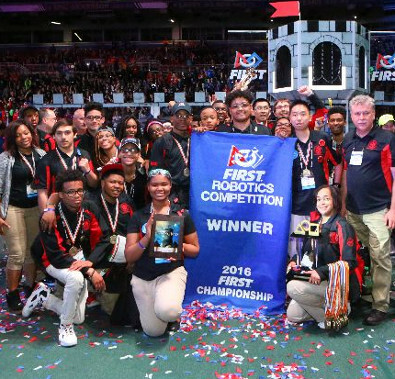 A couple of months before the Cleveland Cavaliers won the city's first professional sports title in 52 years, FIRST Robotics Competition Team 120 "Cleveland's Team" brought a world championship to the Ohio city as part of the Winning Alliance of the 2016 FIRST Championship. The team unites 18 high schools in Cleveland, Ohio's public-school system, giving students a safe place after school to be themselves, learn, grow, and even earn college credits through Cuyahoga Community College. "There are students who heretofore would probably never, ever consider pursuing not only STEM-related activities, but pursuing higher education," says William Gary, executive vice president of Cuyahoga Community College. "This is an avenue for ... encouraging them to pursue positions and opportunities that will help elevate them out of their current economic situations."